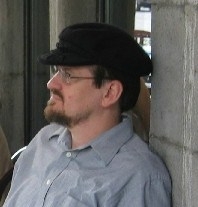 Stephen Dodson is a LibraryThing Author, an author who lists their personal library on LibraryThing. See Stephen Dodson's author page. About meFreelance editor living in the Pioneer Valley (Massachusetts). About my libraryLarge holdings in languages, Russian, classics, travel, history, reference, poetry, literature, Africa, science fiction, Vietnam, music, &c; I'm entering them in more or less that order, with whimsical exceptions. Dec. 15, 2005: All the books in my house have now been catalogued (barring the possible discovery of a few forgotten here and there, lost among my wife's books or behind bookcases), for a provisional total of 3,978. Don't weep for my not reaching the 4,000 mark; I've got at least several dozen more still boxed up in my father's garage in California, which will eventually bring the total comfortably over that milestone. I'm still only #12 at LibraryThing, though; I take my hat off to theraven. Feb. 16, 2006: Just got the first of several dozen boxes of books and magazines from my parents' garage in Santa Barbara, hence the sudden upsurge in my book count; there should be a couple of hundred additions (mostly '60s sf paperbacks) by the time the influx has been fully accounted for.